People tell you all the time that you have a queenly beauty. You brush them off. Who wants to have queen like beauty when you can have empress like power? Beauty is nothing in comparison to power. You could have anything you want at your beck, and call if you were an empress. Besides you are already beautiful. And if you are going to be an empress, why not be a Roman empress? Rome was kind of awesome. There were lavish parties thrown by the rich. They would dine on fresh fruit, and sip the wine of their country. Often times lounging as they ate and drank their fill. They sat talking of the goings on of Rome. All the best gossip of war, hedonism, and betrayal. 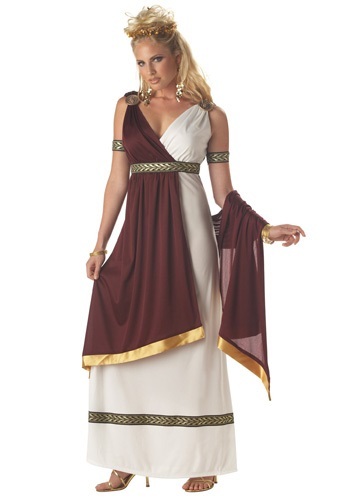 For a woman who already possess the beauty of a queen, we have this Roman Empress Costume so you can not only have beauty, but power as well. You will be kept fairly busy as a ruler of Rome, but maybe you can have the Senate take care of the business of state. While you lounge with your friends. Eating grapes, and drinking wine. Just be sure to keep a dagger on you at all times. Romans are a crafty bunch who sometimes over throw their leaders. You don't want to be the next Caesar, saying "Et tu, Brute?"